Desserts. Let’s be honest here… this is an extremely important, let’s even call it vital, part to a wedding, especially if you have a huge sweet tooth… like Kelley & I! 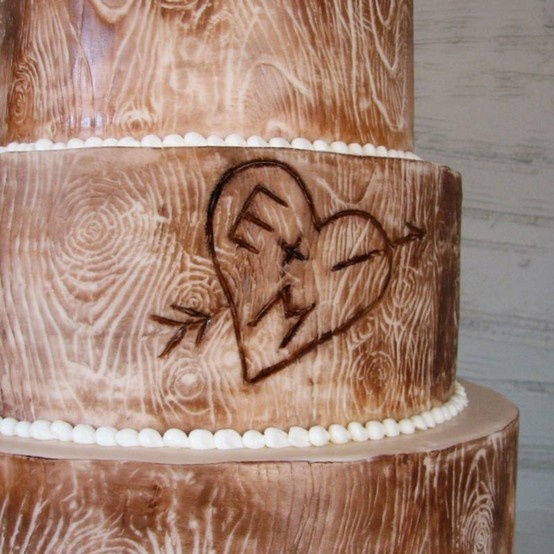 Today, the traditional wedding cake is becoming less of a tradition and more of a rarity. More often, we are seeing an abundance of alternative desserts make their presence known in wedding trends across the country. So for this dessert-focused feature, we are giving in to our sweet tooth and dishing out some of the latest dessert alternatives to traditional wedding cake. Brace yourself, your mouth might watering by the end of this! The first time a couple brought pie to their wedding, it’s like my sweet tooth suddenly hit off an alarm. I LOVE pie. Blueberry, pecan, cherry, chocolate, but above all, I love apple pie. My Nana passed down a recipe for the best apple pie in the world. I know, I may sound a little biased but until you have tried her pie don’t judge, I know many many people who would agree with me! 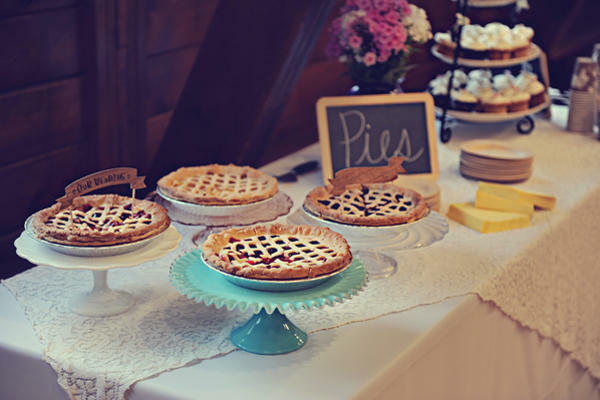 So needless to say I already have a sweet place in my heart for pies, but that aside I think pie is a great alternative to cake because sometimes wedding cake can get a little heavy with the combination of the heavy flavors, icing, and sometimes fondont. Pie can be light, it can be heavy, and best of all you can offer an assortment of different flavors to meet everyones favorites! There is also something so homey about a pie. It makes me feel like it’s Thanksgiving time and I’m surrounded my good friends and family… and who wouldn’t love that exact feeling for their wedding day? Cupcakes are a fantastic idea because they allow you to still get the taste of a wedding cake, but in a smaller, more personalized portion. Selecting cupcakes gives you the ability to pick multiple varieties of flavors, as opposed to a traditional wedding cake that only allows for different flavors on each tier. The greatest thing about cupcake flavors is that there are SO many unique flavors out there. For instance, a popular cupcake joint around here is Gigi’s Cupcakes, and they specialize in delectable flavors such as Chocolate Chip Cookie Dough, Chocolate Salted Caramel, Birthday Surprise, & Hunka Chunka Banana Love. Oh bundt cakes, how The Manor House loves you! Bundt cakes have been a big hit here at The Manor House, especially the mini bundts, which allow for each guest to get their own personal sized bundt in the flavor they prefer. Yes, a bundt cake is still a cake, just with a little bit more unique flair than a traditional wedding cake. Not to mention, they are extremely yummy! Cake pops are such a brilliant idea. It’s a taste of a traditional wedding cake in a bite. This choice is perfect for those out there who maybe aren’t that big into dessert but still want their guests to have a little something. The best thing about cake pops, you can decorate them to be so cute! These bride & groom cake pops are absolutely darling! Who doesn’t love a good, soft, chunky, chocolate chip cookie? I personally love them so when I saw a bride come in a few weeks ago (See her feature here: Kailey & Brian Love Without Stopping) with a cookie bar I automatically fell in love with the idea. Cookies are such a unique idea to incorporate dessert into the wedding without going overboard. Plus, I am sure we all have a friend or two or possibly a mother or mother in-law, who pride themselves in making an excellent chocolate chip cookie and would be willing to chip in. A candy bar is a great option for couples who do not want something heavy and also would like the option for their guests to snack on a variety of candies throughout the evening. Throw some customized boxes or bags out there and it serves as a great wedding favor! Okay, I have to admit… cheesecake is my vice. This is why when I spied cheesecake bites on a stick for a wedding dessert, I went gaga for it! I think this is a superb idea to add some flair to the dessert section of the night. Pass me the cheesecake please! Over the summer the sweetest couple had their wedding here at The Manor House (see their feature here: Churros, Caricatures, Games & Love). Their wedding was overflowing with unique and exciting wedding ideas, but the one that took the cake was their selection of churros for their dessert. The couple loved a local bakery called Rosale’s and special ordered churros for their wedding. It was such a unique and sincere element to incorporate into their day to make the wedding so personable! Dessert bars are a great option for those that want to have it all. A little bit of candy, possibly some ice cream, chocolate, brownies, cake pops… you can incorporate all of these goodies into a dessert bar! This allows each one of your guests to select the dessert of their choosing… or maybe a handful of their favorite desserts :). Elegant and oh so pretty! Adore the ruffles & flowers! This stunning cake was from one of our beloved Manor House bride’s of summer 2012. It fit in with her vintage theme so well, especially when paired with The Manor House’s beautiful silver cake stand! Darling traditional cake twist for a rustic wedding! When choosing a dessert, the best piece of advice to give is to select something you both enjoy and will represent the two of you as a couple. After all, this is your special day! Your love for one another should be reflected in all of the elements of your wedding day, down to the very last bite.